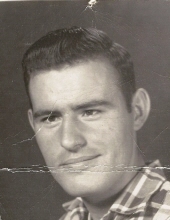 RUMFORD – Mr. Leo A. Arsenault, 79, died Tuesday February 12, 2019 at the Rumford Community Home. Born in Rumford, ME on February 3, 1940 he was a son of Albert and Yvonne (Quirion) Arsenault. He attended Rumford Schools. Leo worked at Diamond Match as a piece worker and then as a janitor at Shop & Save in Rumford for many years. He was a communicant of the Parish of The Holy Savior St Athanasius St John Church in Rumford. Leo was married in Rumford, ME on November 29, 1969 to Marie W. Paul who survives of Dixfield. Other survivors include a daughter, Rebecca Morton of Dixfield; two sons, Michael and his wife Deborah of Anson and Robert Arsenault and many grandchildren. The family would like to thank the staff at the Rumford Community Home for their kindness and caring. Friends and family are invited to sign the online guestbook and share memories with the family at www.meaderandson.com. To plant a tree in memory of Leo A. Arsenault, please visit our Tribute Store. "Email Address" would like to share the life celebration of Leo A. Arsenault. Click on the "link" to go to share a favorite memory or leave a condolence message for the family.